You know how good it feels to watch someone with natural talent working at his craft? That's the feeling you get watching a GSD tending a flock. You watch the dog's instinct kick in and you see a city dog reading the sheep and working like the farm dog of his ancestry. Now it doesn't happen all alone. The dog needs to understand the rules of the game. 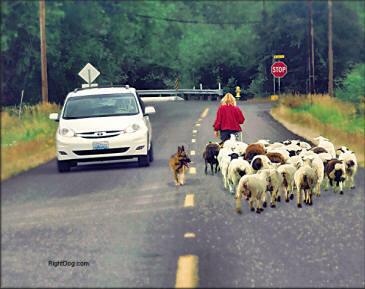 But especially on "C Course", the AKC's version of the large flock tending style of herding, the dog definitely shows the bred-in instinct at work. Herding is unique in that it includes more than just the dog/handler team. You have between 3 and 40 sheep with their own agendas and their own good and bad days who may or may not want to cooperate. It adds another challenge to an already challenging sport. Herding is generally limited by the lack of space and sheep. We are fortunate to have both available in the area, as well as instructors familiar with all of the different styles of herding and livestock. 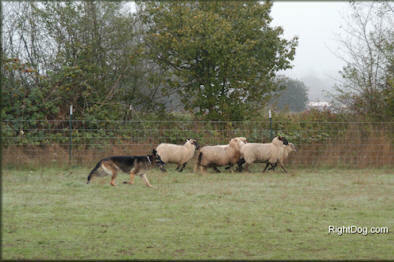 The AKC currently offers 3 "courses" for herding trials. A Course - the most commonly offered - is an arena course requiring the dog and handler to get 3-5 sheep through a series of obstacles and back to a pen. B Course - the classic Border Collie style (or Babe the Pig style) with 5 sheep and a large open field, some gates, a pen, and a timer. C Course - the tending style - a 30-45 minute course starting at a pen, moving down roads, over a bridge, past traffic, grazing in an open field, and returning to the pen. All the while the dog is keeping the flock on the road or in the grazing area, working with little direction. For more information about Herding, come and to our meetings and meet our Herding fans.